The thought of coming face-to-face with big scary spiders and getting caught in their webs will petrify many of you and send shivers down your spine, however it’s time to face your fears head-on as you enter the dark and creepy attic of a lifelong traveller to claim long-lost and highly valuable relics as your own. The Mythic Maiden video slot is powered with software by NetEnt and boasts a structure of 5 reels and 30 adjustable paylines. While you can play for free below with no download needed, those of you who are brave enough to play for real money can do so with all betting lines active from 30p up to a max bet of £150. It’s only the bravest punters who will fancy their chances exploring this creepy old attic as two windows provide just enough lighting for you to view all the items in the cluttered attic. With haunting sound effects of creaking doors and floorboards accompanied by intense gusts of wind, you’ll see ancient coffins, artefacts, skulls and very big spiders. While hearing that may spook you out and make you feel like running for the front door, it’s well worth sticking around as you can secure up to 600,000 coins thanks to the free spins feature where multiplier bonuses and extra free spins join bats in flying out of the dusty old coffin! The fear of the unknown you experience before stepping foot in the attic quickly turns to horror when you see the range of morbid symbols on the pay table of this free Mythic Maiden slots game. Looking out from one of the broken windows in the attic will see you gaze at the full moon with a haunting skull image flashing intermittently. This is the Wild symbol and it can substitute for all other symbols except for the Scatter and when it is part of winning combinations, they are tripled in value. Speaking of the Scatter, this is represented by the mysterious Iron Maiden coffin (it basically resembles a sarcophagus so perhaps the traveller paid a trip to the pyramids of Egypt during his exploration) with blue and red orbs rotating over it and these are key to you spinning the reels for free, but more on that later. The standard symbols will see you uncover shrunken heads worth up to 2,000 coins, skulls with fangs that are worth up to 1,000 coins, ancient books that are covered by a skeletal hand which are worth up to 500 coins, standing your ground in front of big scary spiders will see you rewarded with up to 200 coins, finding treasure chests see you scoop up to 150 coins, while Ace to 10 symbols have also been included and have been designed as melting candles to maintain the spooky theme. While there are all sorts of valuable artefacts to find in the attic, none prove more lucrative than discovering the special Iron Maiden coffins which act as the Scatter symbols. Finding three of these at once will see you receive 10 free spins, four and you’ll be enjoying 15 free spins, while five of them will see you well rewarded with 30 free spins. During this free spins bonus game you will see the coffin open to reveal a multiplier bonus of up to 10x and/or additional free spins of two or more on each spin. Trigger this feature and you’ll certainly be glad you stuck around instead of running in fear as there really are huge rewards on offer! 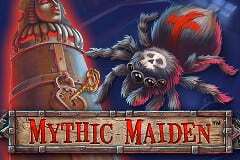 The Mythic Maiden slot by NetEnt certainly makes it pay to be nosey by exploring the dark and dingy attic of a lifelong traveller who has accumulated an array of valuable artefacts and valuables over the years. However, over the years they’ve gained some spooky friends in the form of spiders and you’ll need to overcome your fear of them to spin these creepy reels. The combination of morbid symbols, creepy sound effects and a very rewarding free spins feature make Mythic Maiden a fantastic slot. So, what are you waiting for? The attic awaits!